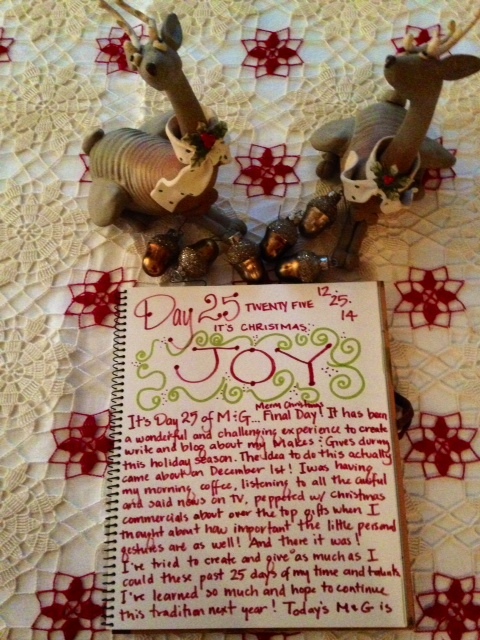 Day 25 Make & Give: JOY! 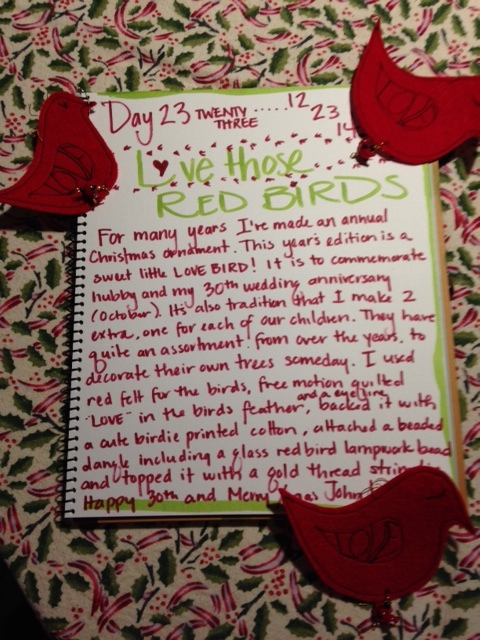 It’s Day 25 of Make & Give. We made it! Merry Christmas to you one and all! It has been both fun and challenging experience to create, write, blog and deliver my Makes and Gives during this holiday season. The actual idea of M & G came about on the morning of Day 1/ December 1st. I was having my morning coffee, watching all the tragic and sad news interspersed with commercials advertising big time, lavish holiday gifts. I started to think about how some of the loveliest moments and gifts I have received have not always been the ‘big’ ones, and that what’s really important is the gift of one’s time and effort. Sometimes, I feel that it’s the little things that really count. 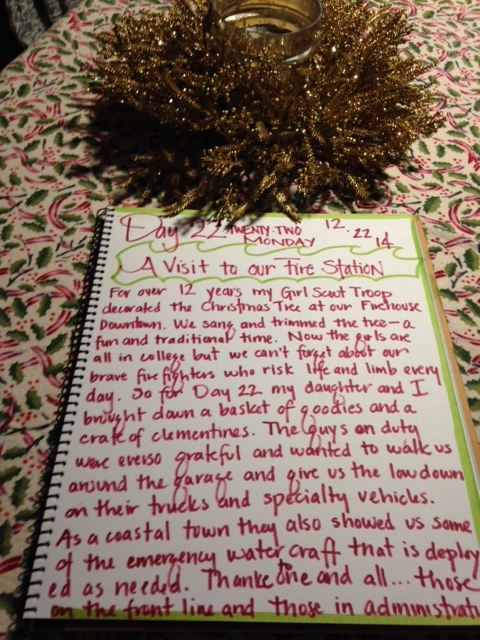 25 Days of Make & Give was born! I have tried to make and give as creatively as I could these last 25 days. I’ve learned so much during this time and a looking forward to doing the same next holiday! Today’s M & G is all about the JOY of the day and is dedicated to all those who have spent time, effort and TLC preparing the foods of the season and of meals to be consumed. 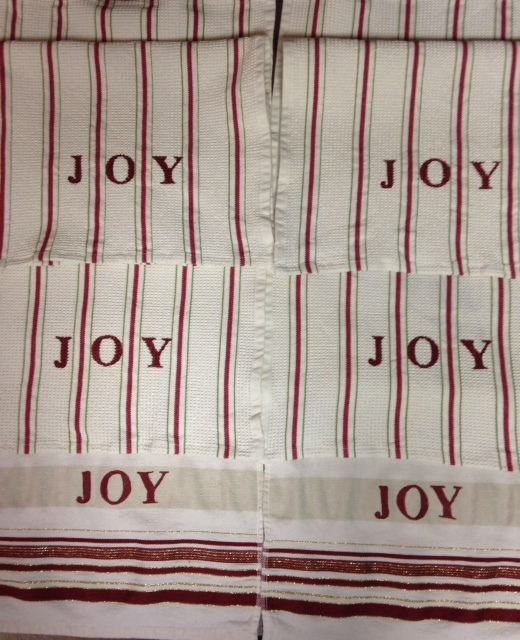 I hand painted dish towels with the word JOY on them and will gift them to my dear family and friends who have cooked, baked and shared their yummies with me and my family! I wish you all a beautiful day today, filled with Peace, Love and JOY! Thank you for joining me these past 25 Days! I so appreciate your following and your thoughtful comments! For the New Year, I am looking forward to making and sharing lots of cool, fun and interesting projects, ideas and resources. Today is the twenty-fourth day of my special holiday season of giving. From now until December 25th, I plan to make and or do something special for someone I may or may not know. I’m hoping that these little acts of kindness will inspire my readers and their friends to do the same! 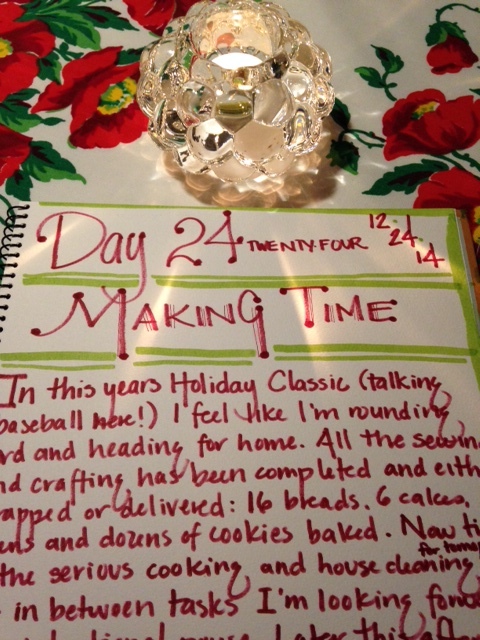 In this year’s Holiday Classic of 25 Days of Make & Give (oops, I’m already thinking baseball! ), I feel like I’m rounding third base and heading for home base. All the sewing and crafting has been completed and mostly delivered: 16 breads, 6 cakes, dozens and dozens of homemade cookies, 24 journals and books of all sizes, 24+ fringed scarves, ornies, pillowcases, craft wrapping and more! Now before the real serious cooking begins, for tomorrow’s Christmas Day feast at our home, I wanted to take a few minutes to pause and slow down a bit. Today’s M & G is about making time to reflect on those who have given to me, my family, community and country. There have been kindnesses shown, good times shared and support in times of need. I am everso humbled by all these heroes, those who have passed on and those around me. Ever blessed am I to have had the privilege of knowing so many amazing people throughout my life. I have so much to be thankful for: past, present and future. 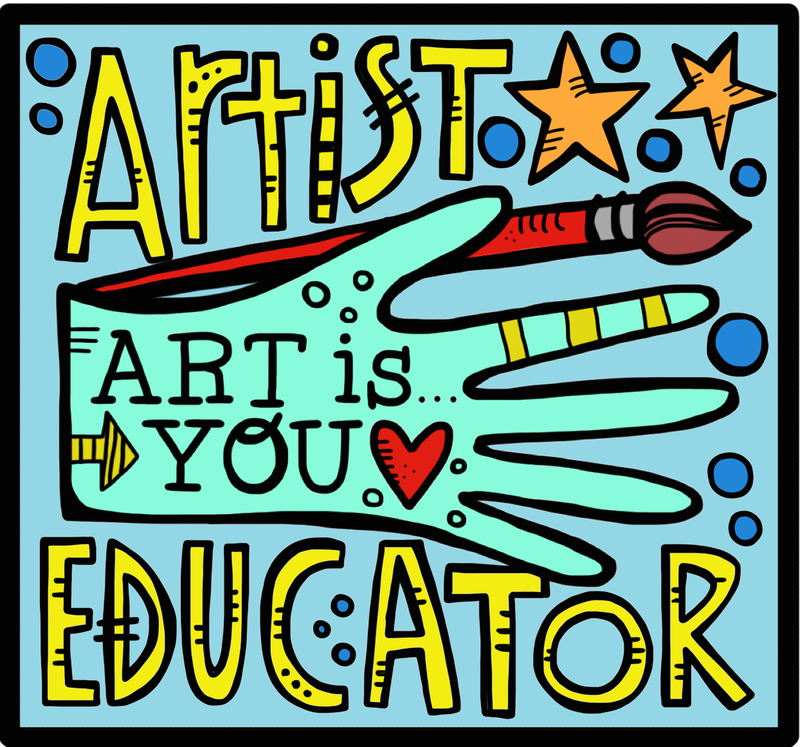 Especially grateful am I to those creative friends who have shared their knowledge and passions with me. So much of who I am and hope to be, creatively, is because of them and their generous influence. Thank you dear ones for the light you have shown me. 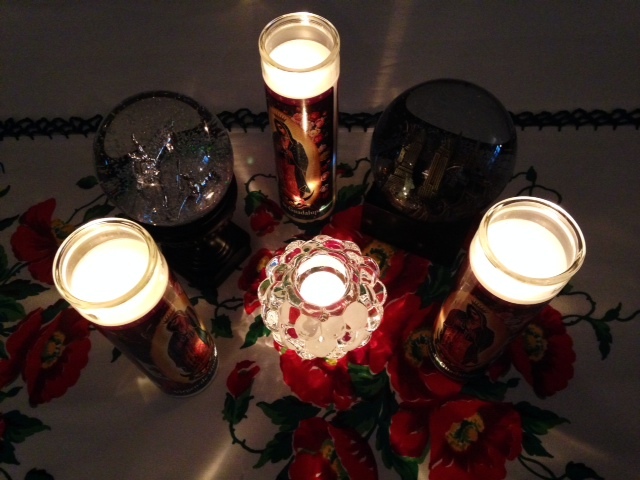 As I sit here and write this post, I have lit a bunch of candles for you all! They are lovely sight! Wishing you all a wonderful Christmas Eve. Today is the twenty-third day of my special holiday season of giving. From now until December 25th, I plan to make and or do something special for someone I may or may not know.I’m hoping that these little acts of kindness will inspire my readers and their friends to do the same! Every year I make an annual Christmas ornament. 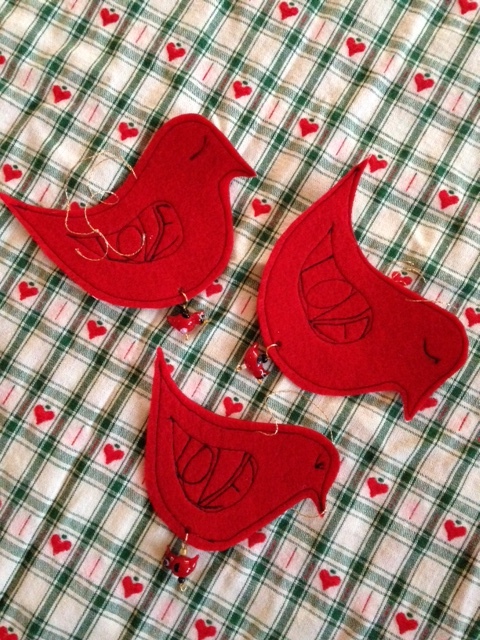 This year’s addition is a sweet little red Love Bird! It’s to commemorate hubby and my 30th wedding anniversary (October). It’s also a tradition that I make 2 extra ornies, one for each of my children. Over the years, I’ve amassed quite a collection for them to hopefully trim their own Christmas Tree someday! I drew my own LB stencil from mylar and cut then them out from red felt. 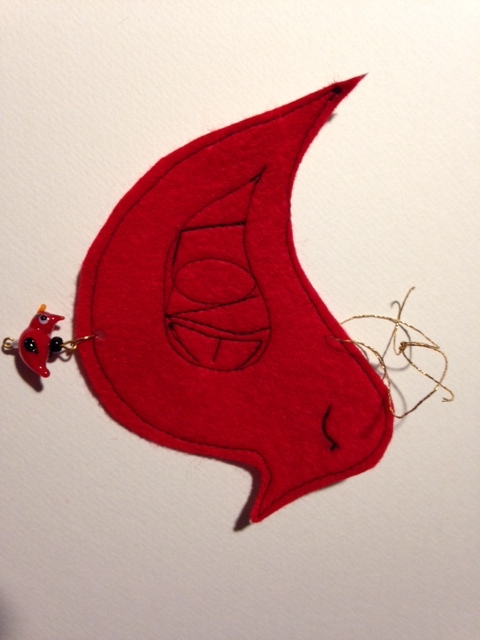 Using free motion machine stitching I stitched the word “Love” in the bird’s feather and also a little sleepy eye. There’s a beaded dangle with glass lampwork, red bird bead on the bottom and I used gold thread as a string tie on the top. Happy 30th and Merry Christmas, John and Children! Today is the twenty second day of my special holiday season of giving. From now until December 25th, I plan to make and or do something special for someone I may or may not know.I’m hoping that these little acts of kindness will inspire my readers and their friends to do the same! For over 12 years my Girl Scout Troop decorated the Christmas Tree at our Downtown Firehouse. We sang holiday songs and trimmed the tree and delivered home made cookies to the firefighters. They were always so appreciative of the girls efforts. Now the girls are college juniors and unfortunately aren’t available to trim the Tree. 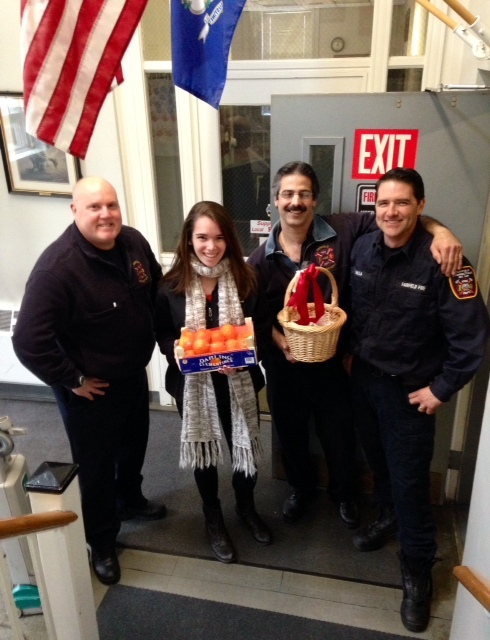 Today for Make & Give, my daughter and I went down to visit our brave and fearless firefighters and to deliver treats and a crate of clementines. Grateful as always, the guys on duty wanted to take us on a tour of the garage and give us the lowdown on their trucks and other emergency vehicles. Very cool stuff indeed, especially the emergency watercrafts necessary for water rescues, in a coastal town as ours. So we thank you one and all in our fire department for keeping us safe every hour of every day…you’re the best and you all stay safe as well! 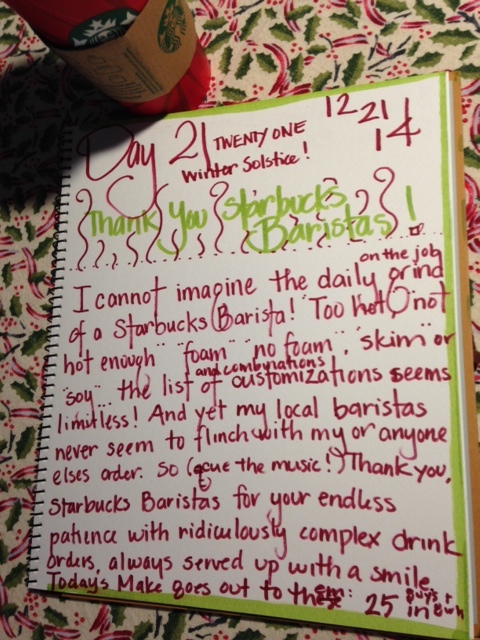 Day 21 Make & Give: Thank You, Starbucks Baristas! Today is the twenty first day of my special holiday season of giving. From now until December 25th, I plan to make and or do something special for someone I may or may not know.I’m hoping that these little acts of kindness will inspire my readers and their friends to do the same! Thank you to my Starbucks Baristas, for making my Grande, 1/2 cafe, non fat, one pump Mocha with drizzle perfect every time! 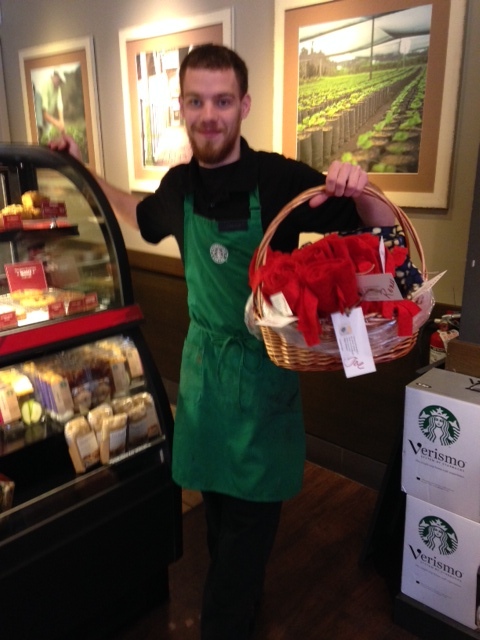 My Make & Give goes out to the 25 baristas at 3 of our local Starbucks…a hand-fringed fleece scarf to each with my gratitude! Those lil Mochas get me through those long two jobs in one day! 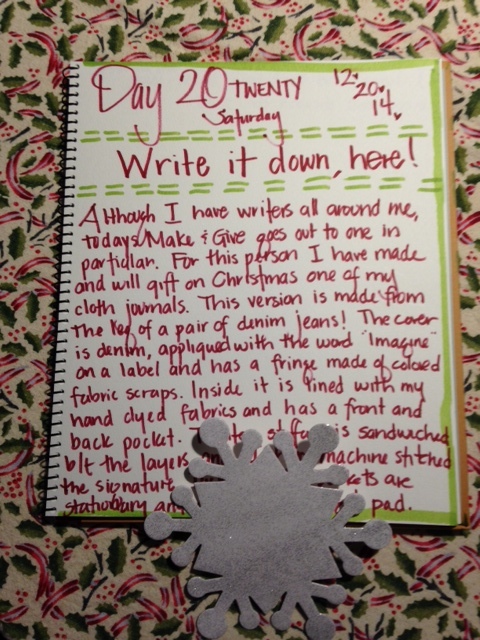 Day 20 Make & Give: Write It Down, Here!! Today is the twentieth day of my special holiday season of giving. From now until December 25th, I plan to make and or do something special for someone I may or may not know.I’m hoping that these little acts of kindness will inspire my readers and their friends to do the same! Although I have writers all around me, today’s Make & Give goes to one in particular. 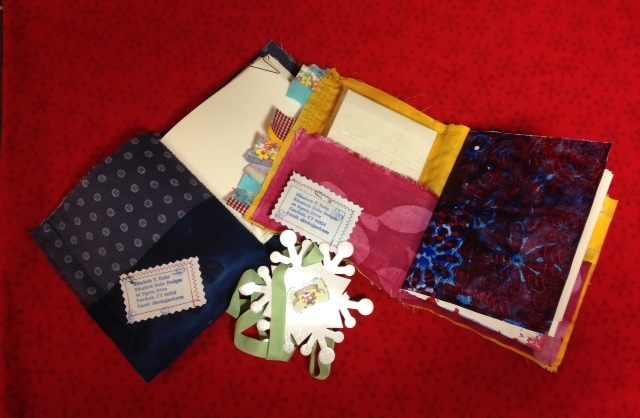 For this person I have made and will gift one of my very special cloth journals. 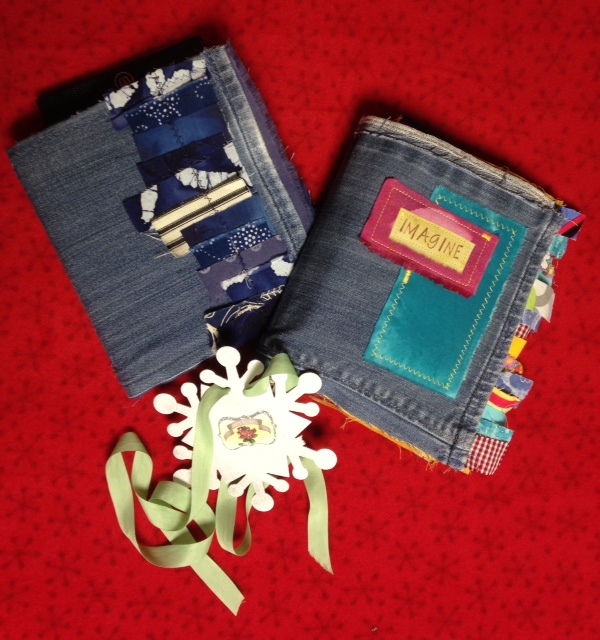 This version is sewn using the leg from a pair of denim jeans! How I love to recycle! 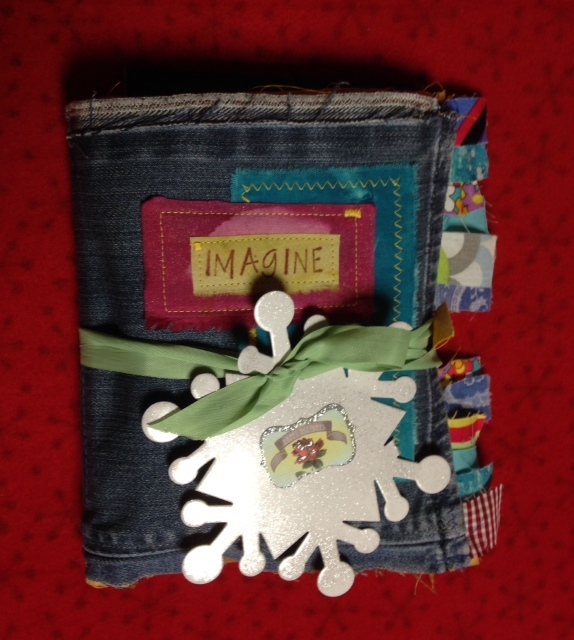 The denim serves as the cover , it is appliqued with a stamped label that says “Imagine” and has a colorful fringe made from fabric scraps. Inside it is lined with a piece of my hand dyed cloth and has a pocket in both front and back. I have tucked stationary and a mini yellow legal pad inside as extra treats! I hope this journal will house the writer’s ideas and dreams for the New Year, 2015. 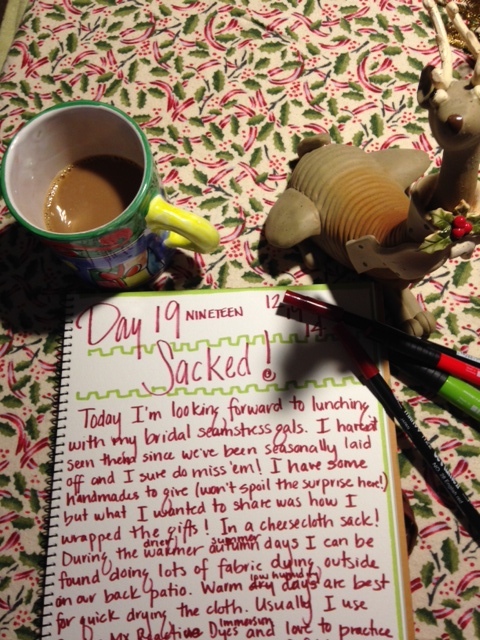 Day 19 Make & Give: Sacked! Today is the nineteenth day of my special holiday season of giving. From now until December 25th, I plan to make and or do something special for someone I may or may not know.I’m hoping that these little acts of kindness will inspire my readers and their friends to do the same! Today I am looking forward to lunching with my bridal seamstress gal pals! I haven’t seen them in a few weeks since we have been seasonally laid off and I miss ’em! I can’t wait to hear what they have been sewing and making! 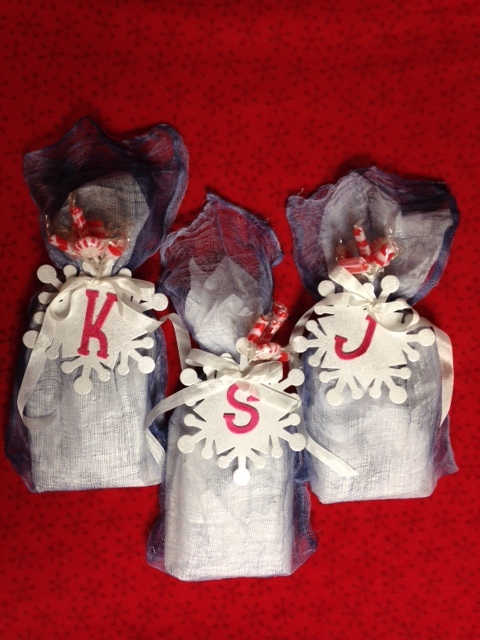 I will be gifting them some handmades but what I’d like to share is how I wrapped their Christmas gifts: cheesecloth sacks! On sunny summer and early autumn days, I can be found outside dying fabric in my back yard. Warm, low humidity days are perfect for quick drying. I usually use Procion MX Reactive dyes for Immersion Dying (in 5 gal buckets). Sometimes the fabric goes in the dye bath as is and sometimes I use Shibori techniques to bind and tie. I dye all kinds of natural fiber fabric pieces, trims and cheesecloth. 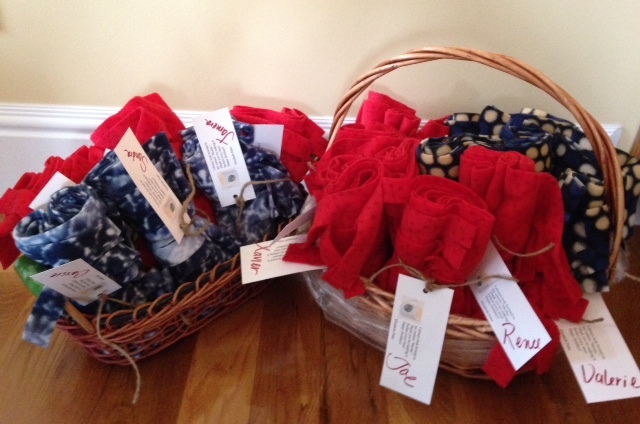 When they are done in the bath, I lay them out on the grass or over a clothes line to dry. Cheesecloth dyes super quick, it absorbs the dye almost instantly. Indigo was my go to color this season, love, love! 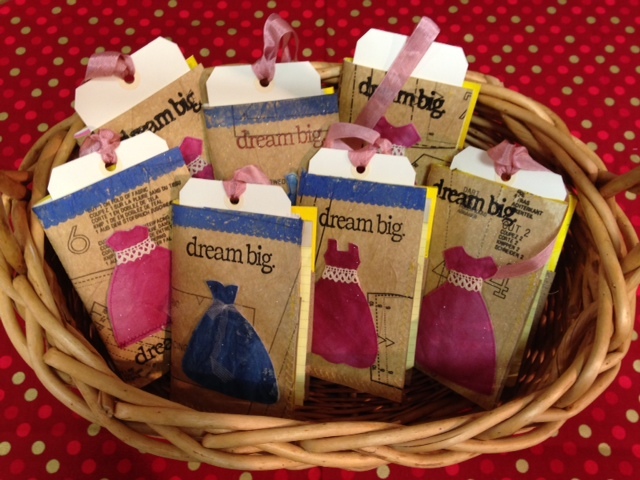 My little gift sacks use up only about 12″x by the width of the cheesecloth. And even though cheesecloth has a very open weave and is pretty dimensionally unstable, I can still feed it through my serger to make the side seams. I leave the tops of the bags with the raw edge, very organic looking! For embellishing, I glitter spray painted chipboard snowflakes silver and initials hot pink. 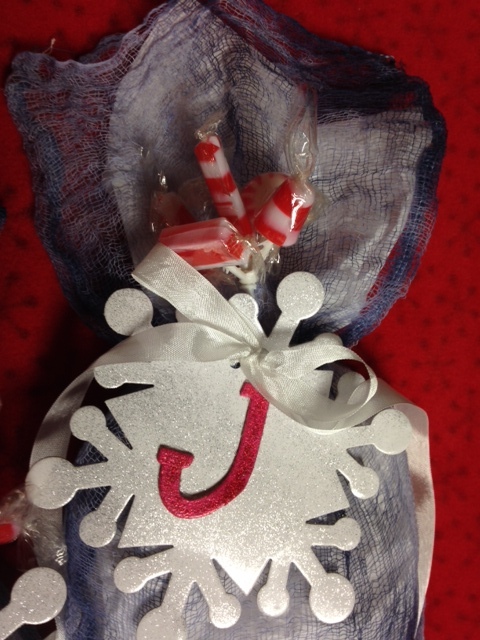 Rayon bias tape was used to tie up the sacks and peppermint floral pick was the finishing touch. 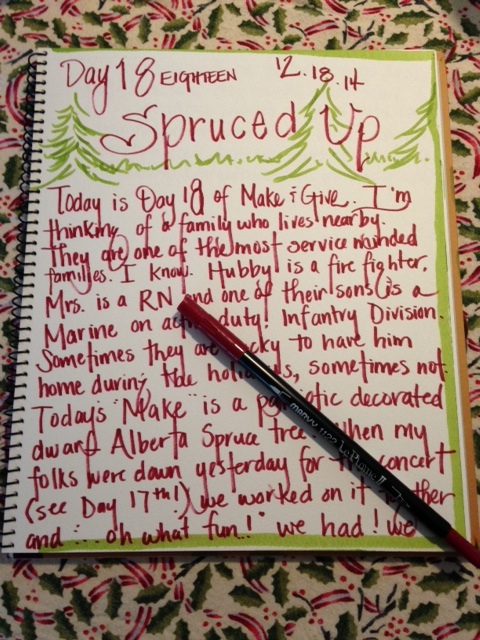 Day 18 Make & Give : Getting Spruced Up! Today is the eighteenth day of my special holiday season of giving. From now until December 25th, I plan to make and or do something special for someone I may or may not know.I’m hoping that these little acts of kindness will inspire my readers and their friends to do the same! 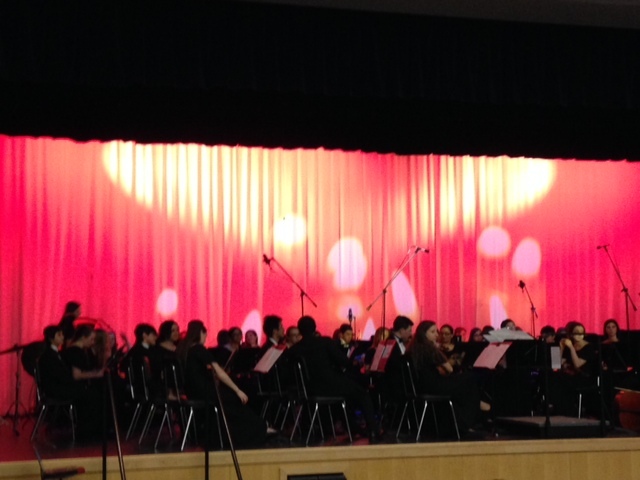 Yesterday I had the gift of attending a holiday concert with my son and parents at our local high school (unfortunately hubby was at work and daughter is still away at school, that would have made it perfect!). I think about how some families might not be able to gather together during the holidays for one reason or another. With that in mind, we have a neighboring family who may be in that position. This is a very special family, devoted to service of community and country. Mr is a fire fighter, Mrs is an RN and one of their sons is an active US Marine, Infantry Division. They have been always ready to help in any way. We have known them for years but as all the kids got older, we don’t see as much of them. 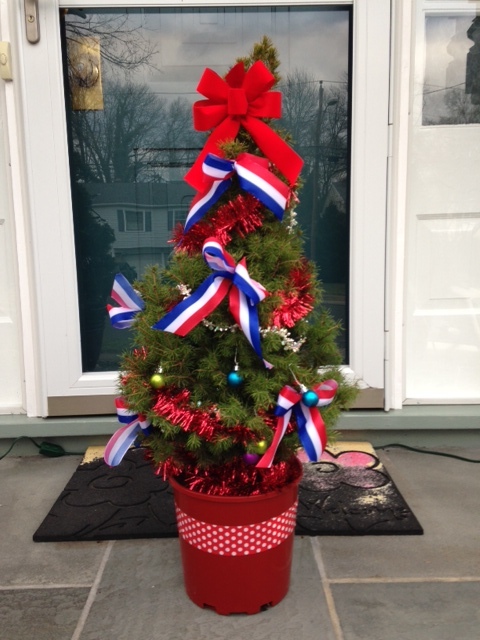 Today’s ‘Make’ goes out to them in the form of a patriotic decorated Dwarf Alberta Spruce Tree. During my parents’ visit, we all helped decorate this tree. I thought they would especially enjoy partaking in this ‘Make’ as my Dad was a Lieutenant in the USMMA. We all had a great time trimming the little tree! 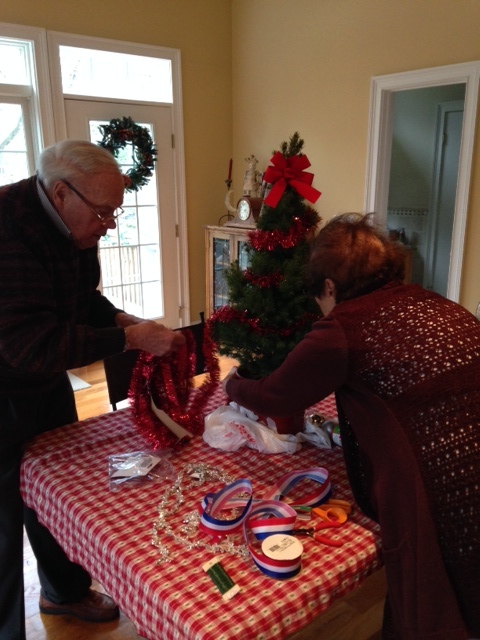 We made bows using wired red, white and blue striped ribbon, red garland and beaded crystal garland, mini colored balls, a red ribbon at the top and a strip of red and white polka dot duct tape around the pot. After the lil’ Spruce was all decked out we drove up and placed it on our neighbor’s front steps with a note. I hope they enjoy it. Thank you to all those that serve and protect our country, their families and all their loved ones. We are everso grateful to you for all the sacrifices you make every day. A blessed holiday to you all! 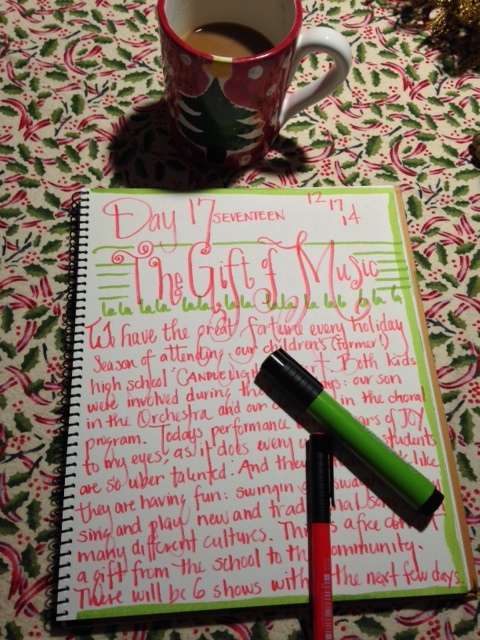 Today is the seventeenth day of my special holiday season of giving. From now until December 25th, I plan to make and or do something special for someone I may or may not know.I’m hoping that these little acts of kindness will inspire my readers and their friends to do the same! 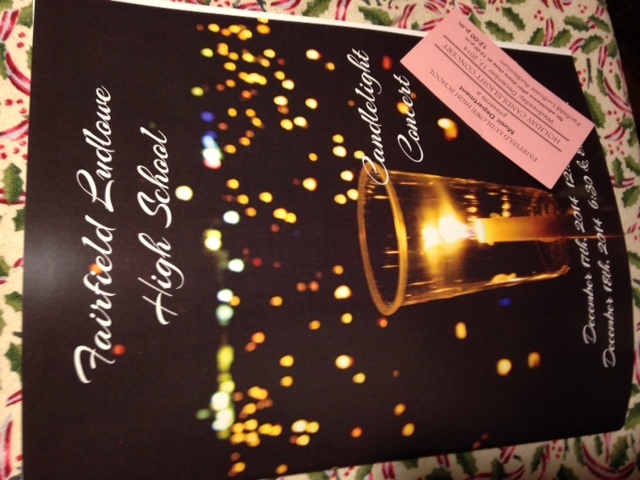 We have the great fortune every holiday season of going to the “Candlelight” concert performed by the students at the high school our children attended. Both our kids participated each year: our son in the Orchestra and our daughter in various choral groups. Today’s show, like every year, brings tears of joy to my eyes! These students are so incredibly talented! There’s a symphonic orchestra, a wood wind ensemble, a jazz ensemble, a women’s chorus, a capella groups and chamber singers. Fifteen pieces were sung and or played. The seting is very intimate, with the only illumination being the backlighting of the stage and the battery-powered candles that the singers carry. The concert is continuous: one song after another with the kids moving silently on and off stage and up and down the aisles of the auditorium. Every bit of this one hour production is perfectly coordinated. The weeks leading up to concert, they will put on 6 shows, are filled with gruelling practices, they even record a CD! Tired as they are, these kids rise to the occasion and sing and play their hearts out. As I sit there, I believe that all feels definitely right with the world even if only during this brief delicious time. The concerts are free, a gift from the high school to the community. What a gift! My “Make” today was to give our choral director, Mr. C., whom we have known for many years, a homemade bread and a tin of hot cocoa. He will need a little something to snack on during those long rehearsal sessions. I feel so blessed to have again attended this performance with my parents and our son, an alum. 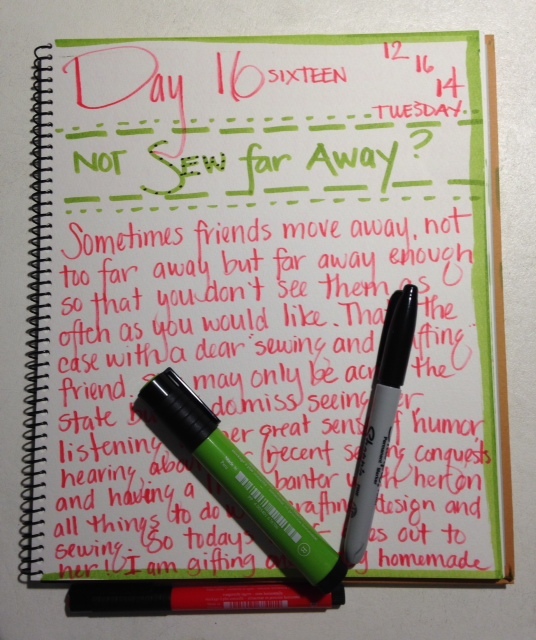 Day 16 Make & Give: Not ‘sew’ far away? Today is the sixteenth day of my special holiday season of giving. From now until December 25th, I plan to make and or do something special for someone I may or may not know. I’m hoping that these little acts of kindness will inspire my readers and their friends to do the same! Sometimes friends move away, not too far away but far away enough so that you don’t get to see them as often as you would like. Such is the case with this fellow creative. She may only live up the coast, but it’s not a quickee trip, if you know I-95 in CT! I miss our banter on all things sewing, crafting and design related, her quick wit and great sense of humor. A kindred spirit, she’s so fun to be around! 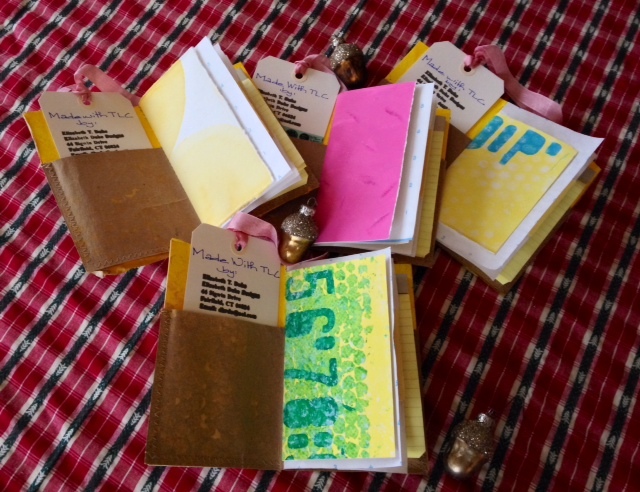 So today’s M & G goes out to her: one of my pocket-sized journals. The cover is made from collaging several layers of sewing pattern tissue and topped with one of my ‘signature’ little hand dyed, stitched cloth dresses and embellished with a bit of vintage trim. The signature is filled with my hand painted papers and has a pocket sewn into the front and back covers. A mini yellow legal pad fits nicely into the back pocket (I am a major list maker with a obsession with yellow legal pads of all sizes!). I love this travel sized journal, it slides easily into your tote or bag… perfect for trip taking. Also included in the package is a copy of Pentatonix Holiday CD. I think this young, vibrant a capella group is amazing! It is my go-to CD this season when I’m working in my studio! Enjoy your gifts, my friend and B-Inspired!